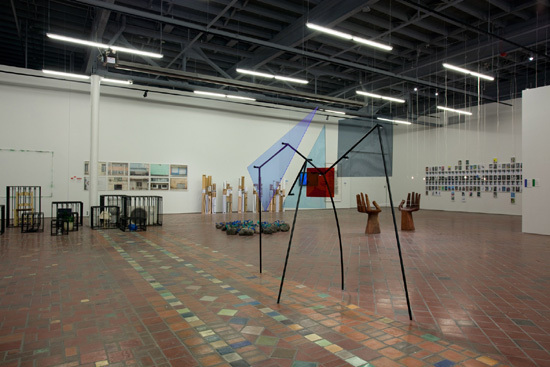 Installation photo from United States of Latin America at MOCAD, 2015. Courtesy of Kadist Foundation and MOCAD. Not long ago, a Venn diagram could get someone into serious trouble. After a coup seized control of Argentina in 1976, they were banned from schools and textbooks, perceived by the ruling military junta as conducive to seditious ideas. Suddenly, when we’re given this context, the seemingly innocuous Venn diagram sculptures of Amalia Pica resonate with subversive, historical significance. The United States of Latin America, on view at the Museum of Contemporary Art Detroit (MoCAD) brings together works from Pica and 30 other socially and politically conscious Latin American artists, some just now making their debut in the States. The art is on loan from the Kadist Art Foundation, which promotes art that engages important social issues. Viewers confront a deliberately disorienting survey of contemporary Latin American art, reflective of the many dualities in Latin America (like the tension between abundant wealth and extreme poverty, or emerging democracies and hardened dictatorships). The exhibition addresses varied themes ranging from capitalism, violence, ecology, and imperialism. Yet it manages to infuse wit, irony, and understated humor to avoid being drearily heavy-handed. The show fills the primary exhibition space of the MoCAD, a hip urban art museum still in its first decade, just out of the shadow of the Detroit Institute of Arts. The building is a former auto dealership with a graffiti-faced exterior; its spacious interior has the feel of a warehouse (air ducts and other unsightly necessities shamelessly exposed), and the whole place is willfully raw and unrefined. The unpretentious urban venue seemed like an appropriate space for a show in which urban themes recur. Marcelo Cidade’s Addition and Subtraction, for example, is literally sharp commentary on urban boundaries drawn across economic lines. 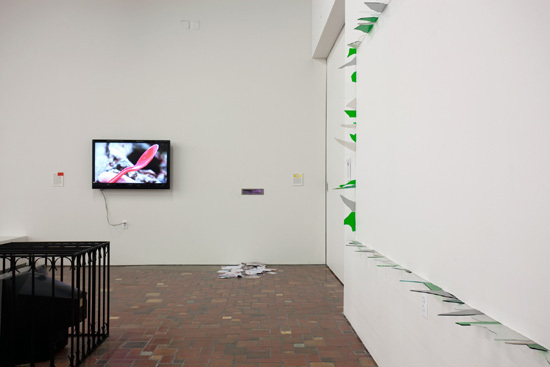 Viewers confront (as close as they dare) shards of glass which menacingly project from the wall and form a rectangular frame around empty space. It references the broken glass atop the walls that surround upper-class homes in Brazil, used as a deterrent like barbed-wire. 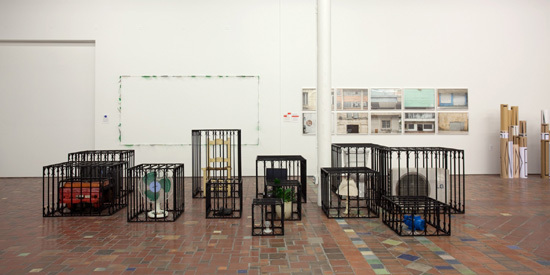 Addition and Subtraction responds nicely with the adjacent untitled installation by Engel Leonardo in which banal household objects are rendered useless by being placed inside steel cages made of the same sort of ornamented bar that might surround gated community. Ironically, the bars themselves, indicative of the presence of something valuable within, become more of a status symbol than the objects they protect. Several works address the presence of American corporations and government in Latin America, understandable given America’s heavy-handed involvement in the region during the Cold War. Voluspa Jarpa‘s Minimal Secret is a pairing of freestanding hinged panels, quite similar to diptychs, their faces inspired by declassified CIA documents detailing America’s involvement in Chile. The panels are transparent, but frequent horizontal bands of censorious black hide any text, leaving us with something as abstract as a Motherwell painting flipped vertically. The documents are declassified, but the reader is still kept out. So many political and social issues are addressed in the show, at times it seems that the exhibition may collapse under its own weight. Beyond economics and politics, the artists confront subjects including gang violence in Mexico, the Peruvian government’s failed attempt at nationalizing oil fields, and ecological mismanagement in the Amazon by American car companies. But broadly speaking, the varied works on view seem united in their expressive cry for justice, whether social, political or economic. As the curators promised, the show is fragmented, but not so much that it’s overlapping themes couldn’t be arranged in something as simple as, say, a Venn diagram. The United States of Latin America runs until January 3. Visit the online home of the MoCAD here and the Kadist Art Foundation here.